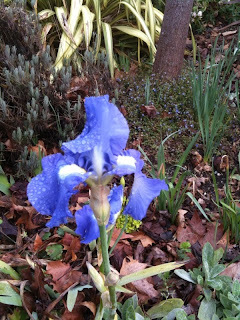 So I found a site for Victoria Falls bearded iris - for those who can't love without it. It is a truly spectacular iris! re-blooming, fragrant, tough as nails - what more could you ask? ...and I picked oranges today - It took me three trips to get them all in the house - anyone for mimosas? I love having something to eat from the garden, even if it's just a branch of rosemary in December. Today, though, we are drowning in oranges. Plum delight. Yum. Also known as Chinese fringe flower. And they are a bit twisted, those bright pink petals. In summer it keeps its purple leaves, and there is color in this part of the garden even without flowers. But now? it's screaming pink. It makes the deep greens of winter pop, and it draws the neighbor kids like bees. "Can I cut some? For my mom?" Or course you may - come any time. They could use a haircut, and I have kid-sized shears. But be very sure you know where all your fingers are before you squeeze the handles. I'm trying to beat the rain and finish the stairs at the Mother's Day patio (that story is in my book. Postcards From The Hedge - out March 20th. On Amazon). I had put in a wonky staircase just so we could get to the compost, but I built it when we were exhausted from building the patio...you had to crab-walk up the stairs. Carefully. Not in heels. Put a crimp in the cocktail-hour garden circuit. Now you can come visit and you won't have to crab-walk! You can wear heels, and drink wine, and comment on how the hellebore have never been more stunning, and isn't the loropetalum lovely? but don't come until it quits raining - it's getting dark at noon and the wind is howling - I think there's a storm front coming. On my way to Jan’s yesterday, a quail ran across the road in front of me. I slowed to a crawl, for I’ve never seen a solitary quail, they always travel in herds. Okay, okay, I know - officially it’s a covey, and a gaggle of geese and a murder of crows - but when quail are scampering along the ground they look just like a herd. As I crept forward another quail popped out of the brush on the opposite side of the road. He feinted a few times, then dashed across the road right in front of my bumper. He was followed by a dozen more quail in a scuffling scurrying panic. As they disappeared into the manzanita I felt unexpectedly happy. And grateful I had slowed down. I’ve never seen a pressed quail on the road, so I suspect I could have continued apace, but the wild things right now have house-building and baby-making on the brain, and they are not cautious. So I feel more responsibility for them. Later, on the way home, I saw a squirrel ten toes up in the middle of the road, his little dead paws clutching at the air. I think he must have misjudged a leap, for there was not a mark on him. I once had a friend come to visit who parked his car in my driveway with the sunroof open. 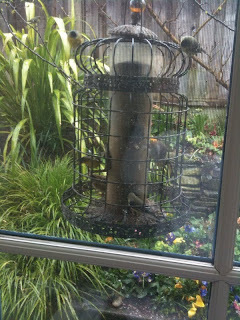 When he opened the door as we were saying goodbye a very irate squirrel dashed out of his car, chattering and scolding. We think he fell off the wires that crossed the driveway, and into the car through the sun roof. We were amused; he was not. But he was very lucky, for every day or so there is the sad sight of a new dead squirrel in the street. I thought about how seeing wild things, quiet and shy, makes me feel all is right with the world. And seeing wild things dead brings a sadness that lasts a long while. We in our cars are unwitting predators; it’s not a fair fight. So I will slow down and cede the right of way to those creatures who were here first. It's the least I can do for the leap of joy they bring to my heart. It's called Victoria Falls. I have cut armfulls of long blue stalks for Thanksgiving. I have had a bloom or two at Christmas. In spring it is masses of fragrant blue flowers at just the same time that Golden Celebration, that fabulous David Austin rose, is throwing huge long arms of yellow roses, weeping under their weight. And it is blooming today, cheering a drizzly gray day. Someone asked me "What's your favorite flower?" I answered "Whatever is blooming now." Yesterday was sunny and cold, and starkly beautiful - just green grass, blue sky, gray trees. 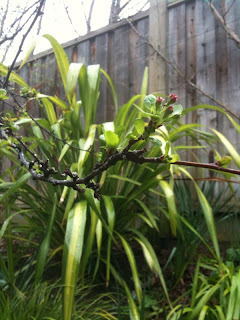 Today it is overcast and the buds are opening - the white plums and almonds first, the crabapples and Ian's peach are in a race - the crabs have mouse-ear leaves out but no flowers; the peach has cracked open its pink buds but no leaves. Hoping they both open when the bees are warm and busy. We are thinking of getting a hive. Evan who builds beautiful stone walls and gardens also builds old-fashioned hives. I have no idea what that means, but maybe if we build it they will come...we had bees swarming in our garden late last summer. Perhaps this year they will stay. I hope. An empty bee house would be too sad. Wally counted 19 birds on the feeders this morning - a new record. Scads more in the trees. They are like three year olds - they squabble, they only want a perch if someone else is using it...hopefully we will have babies soon. In lovely nests made of twigs and doormat (they are pulling them apart) and dryer lint. Liz has chickens; her nests are made of twigs and tiny chicken feathers. ...and this afternoon. It's gloomy and raining but it's spring on the table! an old seed tray stuffed with plants - I took it to the nursery to test-drive combinations - decided today needs bright colors. Pale pansies just looked sick next to the bright pinks and yellows. Every time I look out the window at the trees dripping and the bare branches I see this and I smile. How can you not be mad for hellebore? They bloom, and I forgive them everything. On this gray day when all else is bare and cold, they are happiness. I have been seduced. By a yellow hose at Navlet's. I know, I know, in lectures and articles I have railed against loud hoses, against the seasick green of most hoses - who thought that color up? and has he ever actually been in a garden? and against rubber hoses in general - they are too heavy, when dragged across the garden they do a bit of amateur bulldozing, making a hash of your newly planted lettuce bed. I know better than to let it loose in my garden, and yet I am ignoring my own advice. I picked it up and put it down. I walked out of the store, and I almost made it to my car. I went back - I could not resist the siren song of that yellow garden hose. It comes in red, too...but I was smitten by the yellow. It looks great in the back of my car. We will have to see how it looks in the garden. I suspect it will migrate around a bit before settling into a permanent home - like so many of the plants in my garden. What's next - gnomes? I shudder to think. Well it doesn't look like that now. Daffodils are blooming, hellebores are ringing, and daphne makes the whole garden sweet and citrusy. It has been raining for weeks, suddenly it's sunny and I am going out to prune roses and pick daffodils. And maybe move a lilac.